So it looks like cyclist are finally being heard in Charlottetown. We have a series of bike lanes being created around the city. Additional signs to help remind drivers that we exist, and now bike racks for the buses. 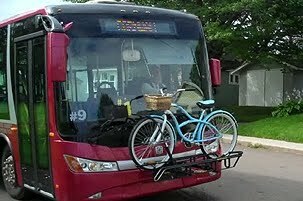 Charlottetown Transit is planning to add bike racks to most of its buses, and the first one is already installed on the bus running between Cornwall and the capital city. The rack added $1,500 to the cost of the new $400,000 bus. The two-bike rack sits on the bus's front bumper. Coun. Marlene Hunt, chair of Cornwall's transportation committee, said using the bike rack is a lot faster and safer than dragging a bike onto the bus. "To have a bicycle loose inside the bus is a little bit dangerous," said Hunt. Hunt was the first to use the new bike rack. "For myself and probably for a lot of people, they get off work maybe an hour before the bus arrives to take them back to their town," she said. "That gives me a chance to bicycle around Charlottetown and get some exercise before I head home." Charlottetown Transit intends to install the racks on all its buses, but it will take a little extra work on the trolley-style vehicles that run around the city. The small front bumpers on the trolleys will have to be modified to carry more weight. "Machinists could make something very easily, and then with the right engineering we could put it in," said company general manager Bobby Dunn. "It's just a matter of getting someone to design something, and then implementing it. And getting the money to do it too." Dunn estimates it will cost $50,000 to outfit all 20 buses in the capital city area. He hopes to have bike racks on most of them by next year's cycling season.